How to register iMyFone iPhone WhatsApp Recovery? When you run the program on your computer, a pop-up will appear and you can just click "Register" button and then fill in the license information you received. After that, just click "Register" and the program will be registered successfully. You can also click the menu button in the upper right corner, and then click "Register" to fill in your license information. What is the difference between the trial version and the full version? The trial version and registered version are almost with the same functions. But there are still very few functional differences between them. 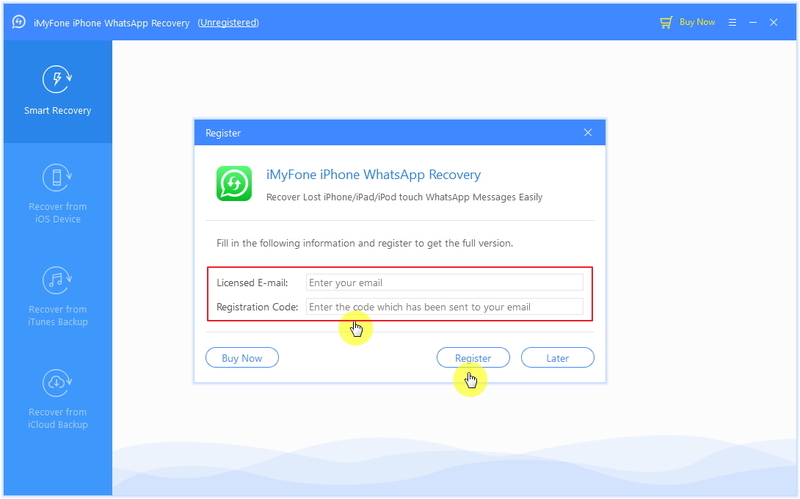 The trial version only supports scanning the iOS device to preview the lost WhatsApp data; while the registered one, not only can preview lost WhatsApp data, but most importantly, it can recover the lost WhatsApp data. Why does the software not find all the lost WhatsApp data? Is it possible to install iMyFone iPhone WhatsApp Recovery on iPhone, iPad or iPod touch? This software can only run on a computer (Mac or Windows), so it cannot be installed on iPad or iPod touch. This is why the program has Windows and Mac version. Can iMyFone iPhone WhatsApp Recovery recover data from encrypted iTunes Backups? Only under the circumstance that you have the password to decrypt the iTunes backup, can this software work. Encrypted iTunes backup file is not available for recovery since the iTunes protect the data for security concern. Can’t log into iCloud account? I tried a lot of times but still failed. Are you sure the password you entered was totally right? Have you tried to log in your iCloud account on iCloud.com? And have you set two-factor authentication for Apple ID? If you have, you’ll be required to turn off the two-factor authentication for Apple ID. Can you guarantee to recover my files? 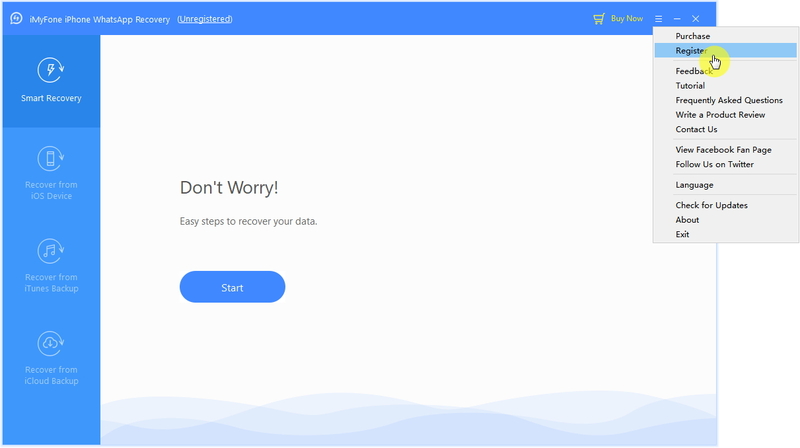 iMyFone iPhone WhatsApp Recovery scrapes together deleted or lost data from your iOS devices, however, the deleted or lost data is easily to be overwritten by turning off iOS devices or filling new data on iOS devices. And once the data is overwritten, no data recovery tools can recover it from iOS devices. How can I play the recovered or exported audio files? If you want to play the audio files of WhatsApp, you need to download and install the corresponding player according to the file extension, or convert the file into the format that most players can open. For example, if the audio message is opus file, you can play it using the player foobar2000.